In many parts of the world clusters of massive white windmills have sprung up in the past two decades, changing the look of the land and generating electricity. This is mostly positive of course, however there is something strange about this phenomenon: it appears the windmills are getting bigger all the time. Obviously, this is good for the energy companies: they can afford these big windmills, and the bigger the mills are, the more electricity they generate. However wind is available almost everywhere. Around your house, around your office, in every city street, and almost everywhere else too. For obvious reasons, we cannot install massive windmills on our roofs. Even the smaller ones, which some “green” folks have in their garden or in the mast of their boat to help generate electricty are not necessarily useful for every situation. However with wind available almost everywhere, it would be nice if we had a solution that can be more ubiquitously deployed, like on every house and every office tower. 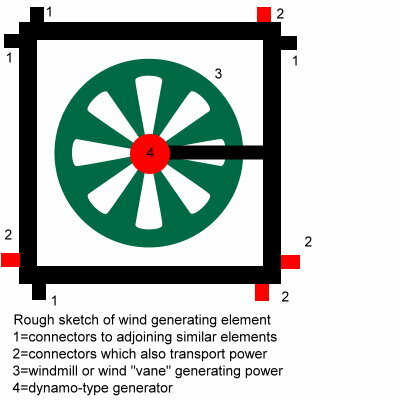 This solution would be a system with grids of smaller elements that generate power from wind energy. These individual elements would be small casings, not bigger than 30cm x 30cm (1ft x 1ft), each containing either a windmill or a wind “vane” (more about the latter later), a dynamo-type device to generate the actual power, and wiring and connectors to connect to other such casings within the grid. It may be possible to create very small elements, and the smaller the element the more easily a grid of them could be deployed. The elements would all simply “click” together into the grid (or at most require one screw), and should an element fail, it would be a matter of minutes or less to swap it out with a working one. 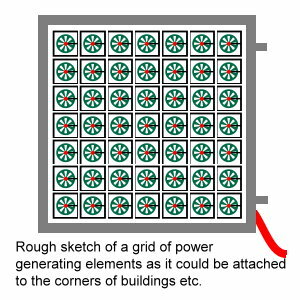 Grids of these power generating elements could be attached to for example the corners of office and apartment towers, starting at one or two stories above the ground and going all the way up, and extending out several meters from each building corner. Smaller grids could be deployed on the roofs and corners of houses, in gardens, on light posts in the street and elsewhere as stand-alone setups, and various other usage locations could be imagined. The key to the usefulness of the system would be the ability to quickly swap out faulty elements, which would also be low-cost due to mass production and standardization. Recycled plastics and metals could be used in manufacturing to give the product an ever greener edge. Coming back to the wind “vane” mentioned above, this is a more unusual suggestion, in which the windmill concept would be replaced by a type of computer-designed “blade” or vane which would flutter up and down in the wind and generate electricity that way. The design of the curving of the vane would depend on local wind condition averages. If this were a viable alternative to windmills, it could potentially have benefits in the area of wear and noise reduction (any windmills attached to buildings would anyway need to be engineered for low noise emission). 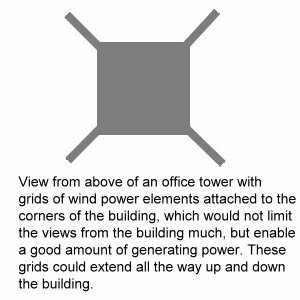 Each grid of windmills would output its power into a control box which would then feed it into battery-type storage (or use a fuel cell system for conversion to and from storage), or alternatively be “standardised” and fed into the building or the power grid. Using this system, power could be generated everywhere in the city, and not just be dependent on large power companies erecting massive windmills which can only be deployed in special remote locations, and are too expensive for the average household or company to deploy.